Read the Vauxhall Zafira Tourer MPV (2011 - ) car review by Auto Trader's motoring experts, covering price, specification, running costs, practicality, safety and how it drives. The Vauxhall Zafira Tourer scores points for being an attractive MPV with its swish design. It’s also pleasant to drive, making it a worthy rival to the Ford S-MAX. The Vauxhall Zafira Tourer might be ‘just’ a people carrier, but its design team has done an excellent job of making this MPV attractive and purposeful. British design director Mark Adams told us his team sought inspiration from the Japanese Bullet Train and wanted to make it cut through the air as easily as possible. As a result the Zafira Tourer spent over 600 hours being honed in the wind tunnel and is currently the most aerodynamic vehicle in its class. At the front there are distinctive ‘Boomerang’ headlights, while a flush-fitting rear window and lights add to the sleek appearance of the Zafira Tourer. The result is a car arguably better looking than the Ford S-MAX, Grand C-MAX, Volkswagen Touran or SEAT Alhambra it competes with. In a bold move, Vauxhall is selling the Zafira Tourer alongside the Vauxhall Zafira, which has been on sale since 2005. The new model shares nothing with that car and its interior trumps it in every respect. But, Vauxhall expects the old model to continue selling to buyers seeking value and a more utilitarian interior. This has allowed Vauxhall to target more luxurious competitors with the Zafira Tourer’s interior and it does feel much more expensive inside. The dashboard is generally attractive, but has too many buttons that look the same and a confusingly laid-out set of on-screen menus with a counter-intuitive controller. An aluminium central rail is a neat touch on top trim levels. The rail has three layers for storage, cup holders and an armrest, which can be slid back and forth independently or removed altogether. Red strips of ambient lighting dotted around the cabin emit a relaxing glow at night. For the first time in a Zafira you don’t have to have a black and grey interior – an optional beige interior is hoped to give a more contemporary and luxurious feel. When it was launched in 1999 the Zafira revolutionised the way we think about an MPVs flexibility. The latest version of Flex7 is better than ever, but it can’t quite match the best rivals for versatility. The middle row now has three individual seats, which slide backwards and forwards, recline through four positions and fold away. However, the middle seat is narrower than the outer ones, and reinstating them once you’ve folded them down is a bit of a faff. SE and Elite trim levels also feature a ‘Lounge’ configuration which turns the middle seat into a large armrest and sees the outer middle seats move backwards and inwards. The result is a four-seater with limo-like rear space. The rearmost two seats flip up out of the boot floor and can be used by teens or small adults. With all rear seats folded there’s a huge 1,860 litres of space (40 more than the Zafira), shrinking to 710 litres with five seats in place (65 more than Zafira). A FlexFix bike carrier is available, which slides out of the rear bumper to carry either two or four bikes, weighing up to 20kg each. The bike carrier tilts backwards to allow access to the boot, even when fully loaded. 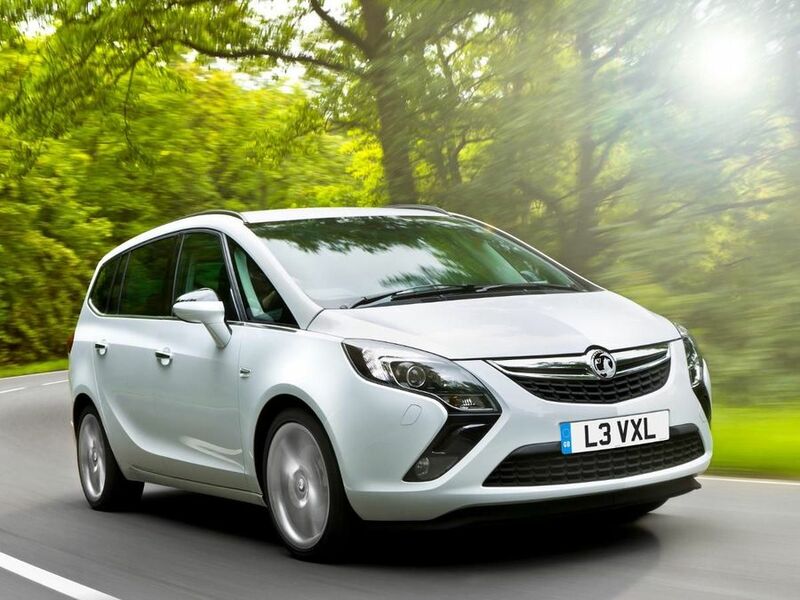 Vauxhall tells us the Zafira Tourer has been honed for comfort and relaxation, but while the car rides comfortably, it’s not as cosseting as the cushiest cars in the class. However, the car does feel impressively agile in the bends, with strong grip and tight body control. It’s not quite the entertainment equal of the Ford S-Max because its steering is lighter and less involving, but the Zafira Tourer still provides plenty of poise over challenging roads. FlexRide adaptive damping is also available, offering an adjustment between Tour (the best ride comfort), standard and Sport (the best handling) modes. These settings also adjust the heft of the steering and the sensitivity of the throttle. However, FlexRide isn’t much of an improvement over the standard set-up, certainly not enough to justify the extra cost. The S-MAX is still the top drivers’ choice, then – just – but the Zafira Tourer is every bit the equal of the Grand C-MAX, Touran and Alhambra. Diesel is king with cars like these, and there are 2.0-litre units with either 108bhp, 128bhp, 163bhp or 192bhp. However, they don’t have the smoothest power delivery, and they’re all way behind the times for refinement, sounding rough and clattery. The 134bhp 1.6 diesel is much more like it, with a broader spread of power and much better refinement. It also delivers some seriously impressive efficiency figures. Choose petrol and the entry-level model is a 1.8-litre with 138bhp and a five-speed manual gearbox, while a more advanced 1.4-litre turbo is available – also with 138bhp, but a six-speed manual gearbox as standard or auto ‘box as an option. The 1.6-litre diesel is by far the best choice for buyers who prioritise efficency. With CO2 emissions of just 109g/km, it qualifies for super-low tax bandings and represents one of the cleanest choices in the big MPV market. Its official fuel economy of 68.9mpg also gives it a long touring range – an attractive feature in this type of vehicle. The 2.0-litre diesels with ecoFLEX badges are pretty decent, too, but the ones without the badge are rather disappointing. The 1.8-litre petrol consumes 39.2mpg and emits 169g/km, while the 1.4 turbo manages 42.2mog and 158g/km as standard or 44.8mpg and 148g/km if fitted with stop and start technology. The Zafira Tourer uses engines and gearboxes found to be reliable in other Vauxhalls, but overall, Vauxhall’s reliability record hasn’t been great over the years. As with all Vauxhall models, the Zafira Tourer has spent thousands of hours being tested to destruction during its development, which seems to have paid off as the Tourer feels well-built, with an interior tough enough to withstand family life. Anti-lock brakes, an electronic stability programme and six airbags are standard across the range and they all helped the Zafira Tourer to earn a maximum five-star rating in Euro NCAP crash tests. Optional safety equipment includes Vauxhall’s Front Camera System, which provides Following Distance Indication, Forward Collision Alert, Traffic Sign Recognition and High-beam Assist (where Adaptive Front Lighting is fitted). There are a large number of trim levels available, but there’s no need to look past Techline trim. Because of the bizarre way that the Vauxhall trim structure works, the Techline costs less than ES and Exclusiv versions, yet gets more kit, including sat-nav, climate control and a Bluetooth phone connection. The trims above that are generous, but very pricey. SRi gives the Tourer a sporting treatment, with 18-inch alloys, sports suspension, sports seats, sports pedals and tinted rear windows. SE is more luxurious and has a sunglasses holder, leather gearknob, chrome trim, aluminium console rails, electric parking brake, enhanced ambient lighting and 17-inch alloys. The range-topping Elite is fitted with leather upholstery and a panoramic windscreen with glass sunroof. The Zafira Tourer isn’t the best large MPV out there, but it’s right up there in most areas. Its sharp looks will be the main attraction for buyers, and if you go for the 1.6 diesel, you’ll enjoy impressively low running costs as well.